Fill the joints between your new tiles with fresh grout in four easy steps. Maybe I’m the only person (at least over the age of three) who gets a kick out of making a mess, but I would still argue that grouting is the best part of a tiling job—and not just because you get to smear mud all over everything. Grouting tile is when everything starts to come together. Your project stops looking like a collection of individual tiles and starts looking like a finished floor (or wall or counter). The mess isn’t a sign of a job done poorly but, rather, par for the course! 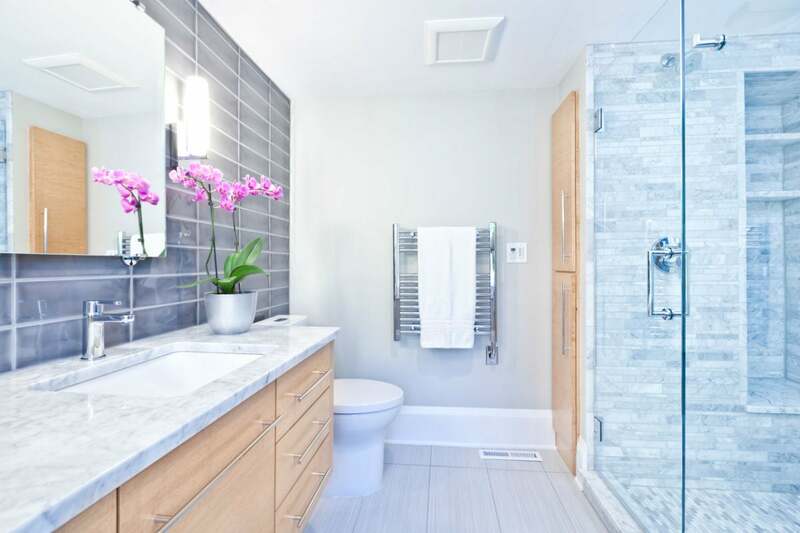 This part of a tile project can be DIYed with ease if you’ve brushed up on how to tile grout and begin with the right materials for your tile surface. We’re here to guide you on both. Traditionally, there are two different types of grout: “sanded” and “non-sanded” varieties. The former is durable and often used in flooring applications, while the latter is best suited for wall tile with joints less than ⅛-inch wide. For the purposes of this tutorial on grouting tile, we’re talking about the mix-it-yourself sanded grout. If you have an existing tile surface that needs re-grouting, you will first need to remove the old grout compound before you follow these simple steps on how to grout tile. A grout saw (like this hand tool on Amazon) or grout removal bit for a rotary tool (like this highly rated bit available on Amazon) are both good options. 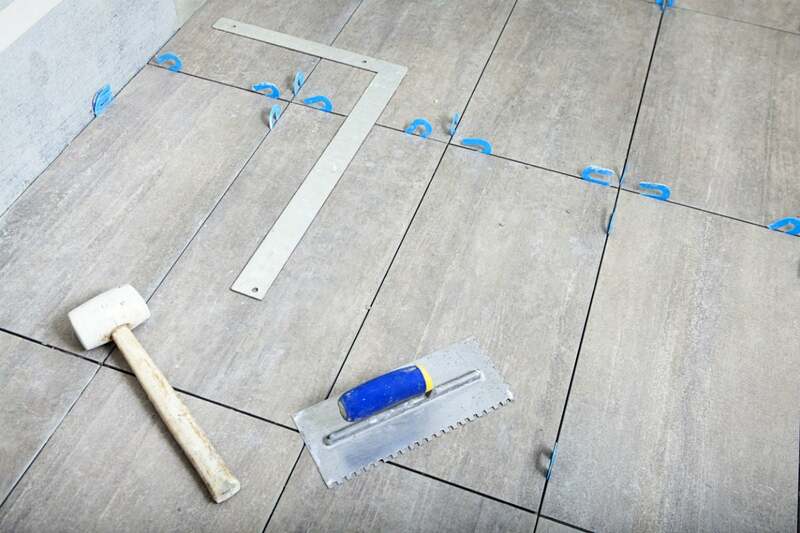 If you’re tiling a new surface, make sure all tiles are fully set and spaced as you’d like before grouting. 1. Mix your package of grout with water in a bucket. When mixing grout, you’ll want to follow the manufacturer’s instructions, of course. But here’s what I do to achieve just the right consistency: Pour only three-quarters of the recommended amount of water in the bucket and then add the grout. Once mixed, then add the remaining water until it looks like a waffle batter—something like this. I find that working in smaller batches and hand mixing with a putty knife or stirrer stick is best, but you could also use a grout mixer attachment for your drill to speed the process along. 2. Use a grout float to press the grout into the space between tiles. First, move the grout float—a specially designed smoothing tool that features a flat and mostly-firm rubber pad—across the spaces at a diagonal to make sure the grout line is filled. Then do a second swipe over the top to clean off the lumps. 3. Sponge off any excess grout that had been smeared onto the surface of the tile. Wait three hours and do it again, this time making sure there isn’t excess grout on the tile or outside of the grout line. Keep your bucket of water close to rinse the sponge, and change it as often as necessary. 4. Wipe the floor clean. No matter how good you are with a sponge, once everything is dry (usually overnight) there will still be a grout haze on the floor. You’ll be tempted to use a wet cloth to wipe it off, but that will put you in a vicious grout-wiping cycle. A better idea is to use a dry towel to rub off any haze. The dust can then be swept up. If that trick didn’t work, give one of these four other methods for how to remove grout haze a try. Learning how to grout tile is that easy! After everything dries I would recommend a good grout sealer. See our recommendations for the best grout sealer here so that you’re sure to purchase the right type for your project.